Cat poops but doesn't pee in litter box? I have three male cats and one female. 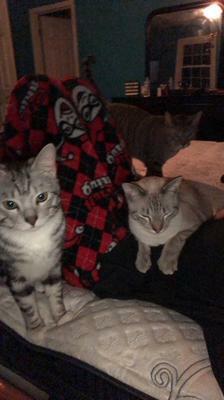 Two of my males, one neutered and one not, will pee on couches, blankets and everything else. I’ve taken them to the vet. They are perfectly healthy and it’s not just spraying. He will fully crouch down and take a pizz wherever. He did not use to until he became 1 year old. Then my non neutered one started. I have a two story house with five litter boxes that I clean frequently, which are all upstairs in one room. They poop just fine in it and I notice sometimes he does pee in it, but mostly out. I’ve even tried Feliway outlet spray. Nothing seems to work. I’ve got special calming treats from the vet and NOTHING is working. Any advice would be great. My thoughts: I'm sorry to hear your cats are having problems. In my experience, sometimes intermittent urinary tract issues can cause these problems. Unfortunately, unless your vet can determine a physical cause, we'll have to assume it's behavioral. Even though it's not spraying, I would consider the possibility one male was triggered and started peeing outside the box as a response. Getting the non-neutered male fixed may help put the two cats on a more even playing field. You have plenty of litter boxes, so that's great. It may help to move one of the litter boxes to the first floor, or add a box to the first floor. It can be difficult to get cats back to using the litter box when there are multiple factors involved, including multiple cats. It may be revealing to separate the two males for a while and see if that has any impact. To that point, you may want to try isolation retraining on one or both cats, and then reintroduce the two cats. Please let us know what works for you.